Wix Review 2019: When (and when not) to use Wix! Wix has become pretty well known over the last few years, in part due to budget-busting marketing campaigns starring stars like Heidi Klum, Jason Statham and Gal Gadot, better known as Wonder Woman. But let's start with the basics. Today, Wix is the biggest player in the website building landscape and hosts a whopping 110 million websites. Wix Review: What to Expect? Wix offers a drag-and-drop website builder to create a site. It runs in your web browser (no need to install any software) and already provides its own web hosting. You sign up, select a template design, and start creating. It doesn’t require any advanced technical skills such as HTML. Their visually impressive layouts are designed for small businesses, restaurants, online stores and artists such as musicians and photographers. They are optimized for mobile devices and can be spiced up with one of the numerous apps available from the Wix App Market. In a way you can compare Wix to a prefabricated house: the fundamental structure already exists and can’t be changed. You can, however, paint the walls to your gusto (choose a theme) and add the furniture you love (photo galleries and other apps). 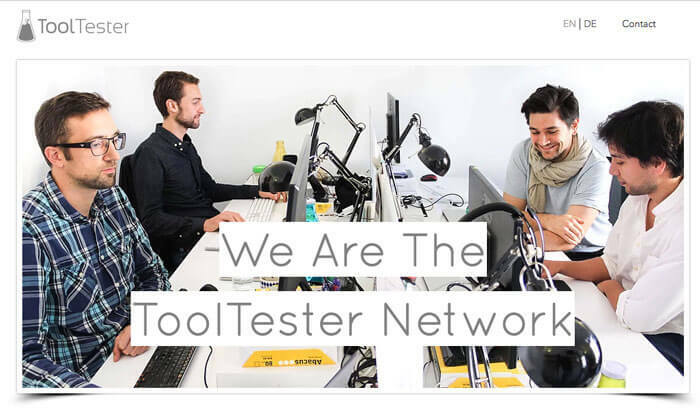 In fact, I used it to create our own bilingual company website called Tooltester.net. We had a particular design in mind and just needed a quick way to build it. Also, I didn’t want to have to think about security updates etc. which meant WordPress wasn’t an option. In the end I considered both Weebly and Wix (our top-rated builders) and went for Wix. With Weebly there was just no perfect way to make our design look good on mobile devices. Working with the Wix editor was a breeze, offering handy tools such as photo filters and animated texts. But before getting ready to swipe your credit card, keep in mind that every website has different requirements. Wix is available for free for as long as you want, but if you require professional features like your own domain name or priority support, you must choose from one of their premium plans ranging from “Combo” to “Business VIP”. The cheapest ad-free plan with a custom domain name costs $11 per month. Create a free website with Wix ads. Not included: your own domain name. Connect your own domain with your Wix site. Your site will still show Wix ads. (Plan is not available in all countries). Ideal for smaller professional websites. No ads and plenty of storage. The right plan if you need a lot of web space (up to 10 GB included). Best plan to create an online store or use premium apps like Wix Bookings or Wix Hotels. Higher plans (VIP & Unlimited) available too. Monthly prices for 1-year contracts; Domain included in selected packages. From our view, Combo is by far the best plan for regular websites without ecommerce. It is ad-free, includes a domain name for 1 year and provides enough storage for most needs. Find our detailed analysis of Wix’s premium plans here. The most remarkable thing about Wix is its templates. The designs are exceptional and offer pre-built layouts for many different industries. Whereas other website builder limit the extent to which elements can be moved around, Wix allows your to finish your work off “pixel perfect”. Wix is one of the few site builders that let you animate text and other elements. But make sure not to overdo it! There are hundreds of website apps that you can add to your website. There is a newsletter tool, live chat software, online booking widgets, etc. All of those can be easily integrated into your Wix website. But keep in mind: many of them are third party apps—if they get shut down you can’t complain to Wix. Wix offers a (relatively) smart assistant to create your website with. But this is only available for some types of projects (e.g. portfolios, yoga sites, etc). For instance, it’ll automatically connect your social media, generate a contact form for you or pick a suitable design for your audience. But don’t worry, if you don’t like something, you’ll be able to change it. More information. Wix automatically creates backup points of your website that can be restored at any time (much like Apple’s time machine system). This way you will never lose any important information. the cheapest ad-free plan with Wix is called Combo, which starts at $11 per month (compare Wix’s premium plans). The competition offers cheaper options: Weebly’s cheapest plan without any advertising starts at around $8, for example. Once you have chosen your initial template, you can’t switch to a completely new one. You can certainly change the design within the template, it’s not possible to pick an entirely new one. The editor is very easy to understand. If you are stuck, the FAQ section will help. Short introductory videos give instructions on the different functions. 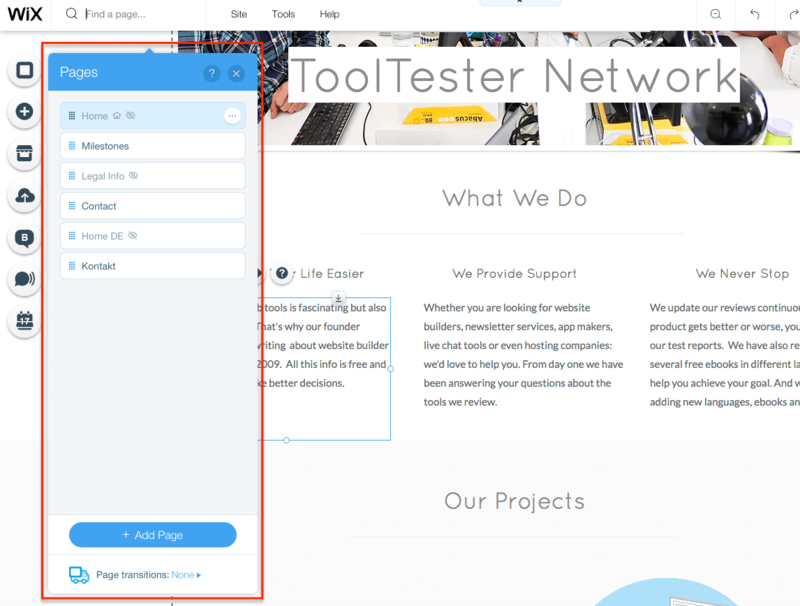 Complete novices will love Wix ADI: this new system holds you by the hand while configuring your website. It’s a bit less flexible but very convenient. What’s best: you can switch to the regular builder whenever you like. The designs look professional and allow for pixel-perfect customizations (see examples). There’s a mobile-friendly version that can be adapted individually. You are also able to embed videos in the background and even upload your own fonts to the Wix editor. Ad-free only from the premium plan “Combo”. The free version and the Connect Domain plan show some pretty visible Wix ads. The editor supports 16 languages. Multilingual sites are generally possible. Here is a guide to multilingual website creation. While it’s a pretty efficient system that is easy to use, we wouldn’t recommend it for larger sites as it’s not ideal for SEO (you can’t use unique URLs for each language). Free domain name for one year included in the premium “Combo” and higher plans. Wix supports domain endings including: .com, .org, .net, .co.uk and .info. Renewal prices start at $14.95 per year. Using the “Connect Domain” package (and higher) it is possible to move your existing domain to Wix or point it from another domain registrar to Wix. More information. Always included: SSL encryption (https). A maximum of two levels is possible. A third level would be desirable as right now it’s not very convenient to manage a larger site with Wix (30+ pages). Also, the more pages you add, the slower the editor tends to load. Wix App Market features a wide range of unique widgets and apps. We especially like Wix Music, to sell and promote music, and Wix Bookings that will let your customers book and pay for appointments and consultations. External applications can be easily integrated as well. You can integrate Google AdSense via their App store. Another possibility is banner ads and affiliate links. An online store is included in the “eCommerce” package. You can also test the function in the other plans. At $20 per month it’s fairly priced (there are no sales fees) and it allows to sell both physical and digital goods while tracking what you have in stock. Learn more in our detailed Wix Ecommerce review. You may have heard bad things about Wix’s SEO capabilities, which was still true a few years ago (more about this here). However, they have improved massively, letting you edit page titles, meta descriptions, and alt tags individually. There are even advanced SEO tools like 301 redirects. Unfortunately, Wix changes image file names into something cryptic (e.g. 09ab7~mv2.jpg/), which is a minor disadvantage. Beginners can use the SEO Wiz, a guided tutorial. For more information, check Wix’s SEO post. Wix’s blog is a pretty good add-on, which is also SEO-friendly. It comes with most of the features that you’ll need (e.g. tags, categories, RSS, etc.). Visitors can leave comments via Facebook or Disqus. It’s also possible to schedule blog posts. With the Wix mobile app you can edit and publish articles on the go. In order to access statistics, Google Analytics must be integrated in advance. There is a simple contact form builder. More sophisticated tools can be found in the App Market. Exemplary! Pages can be allocated an individual password. You can even create a small membership website where users sign up in order to receive personal login credentials. Unfortunately it doesn’t integrate with ecommerce. You decide whether they get approved instantly or manually by you. Both features included in all plans. You can use Wix’s own “ShoutOut” newsletter service. It’s very easy to use but not as powerful as specialized external providers. Read our full Wix ShoutOut review here. Embed various widgets and other tools by means of an integrated app. 500 MB – 20 GB web space, depending on the pricing tier. Please note that there is also a monthly bandwidth limit in most plans. This is only relevant for large websites, e.g. the 2 GB bandwidth of the Combo plan should be enough for about 3,000-5,000 visitors per month). The Unlimited and VIP plans both provide unlimited bandwidth. Wix comes with a very convenient version control system, called Site History, that will let you restore to any previous version of your site with one click. Support center, forum, phone. The documentation is very detailed and clearly explained. If you get stuck, you can submit your question to the forum. Answers are usually prompt but sometimes a bit of email back and forth until the issue is solved. Starting up is very playful and, initially, impressive results are achieved quickly. Wix gives you a lot of freedom in the design process. Wix.com is a smart website builder with optical delights. Easy to use and as flexible as it can get. It’s the perfect website builder for photographers, bands, artists and any kind of portfolio site. If I am being honest I had my reservations about Wix at first as their product hasn’t always been easy to recommend. Back in the days it was Flash-based and always a bit different (like your old classmate who had that weird taste in clothes). However, thanks to their neverending improvements they have become one of the cool kids, slowly climbing our ranking to now claim the top position. Wix and SEO: can we be friends? They even got Google’s John Mueller to publicly state that Wix’s SEO capabilities are fine for their search engine. So unless you are planning on ranking for some insanely competitive keyword you should have no issues with Wix! In the end, SEO depends a lot more on your ability to create outstanding content rather than the website builder. Wix’s App Market: all the widgets you will ever need? One area where they’ve really done everything right is their app store. Most other website builders mainly rely on third-party apps that can break if the company stops supporting them. Wix’s strategy is a bit different: they have created more than 80 high-quality apps themselves. Among those: an appointment scheduling tool (Wix Bookings), the event management app Wix Events, hospitality widgets (Wix Restaurants and Wix Hotels) as well as Photo Gallery and Video tools. And you can bet that there will be more. I would recommend it without reservations for smaller websites (not more than 30 pages) that have to look flawless. Why not also for larger projects, you ask? Unfortunately the navigation menu doesn’t really accommodate complex site structures as there is only one sub-level. Weebly usually works better for big websites. Wix has the widest selection of prebuilt designs for any kind of industry. As it’s not possible to switch to a new theme after your initial choice, it’s more difficult to revamp your site’s design (you’ll have to redesign it manually or start from scratch). On the positive side, this limitation facilitates Wix’s greatest strength: unmatched flexibility within your chosen theme. And even if sometime down the road you would like to get into the ecommerce game you can easily add a shopping cart at relatively little cost. Read our Wix Ecommerce review to learn more. What Wix has created here is certainly impressive in many ways with a development speed that is almost breathtaking. Just make sure you try out the free plan before switching to a paid plan to find out if it’s the right choice for you. Is Wix the right website builder for you? You need a lot of flexibility customizing your design. Wix made it easy to upgrade our company website. Weebly is a great Wix alternative as it’s extremely intuitive and easy to use. Its templates are not quite as stylish (or as numerous) as Wix’s. You have the option to work with different editor accounts on your website, which is great for teams. There are some very advanced features like a membership area and an online store, which feels more mature compared to Wix. Jimdo is similar to Weebly. The website builder includes an online store and blog. There’s also a mobile app for iOS and Android available. Email accounts are more affordable too. We picked the One.com Web Editor as an alternative as the website editor is quite similar to the one of Wix. Not nearly as sophisticated, but a viable alternative for small websites. Their prices can be as low as $2.45 per month (not including domain name and email accounts). Not sure what website builder you should use? Let our smart finder decide for you in 2 minutes. In this section you can find a summary of some technical aspects about Wix. This image shows the so-called “uptime” of our Wix demo website of a period of an entire year. When a website goes down, it means that no one can access it, which is bad for business. The closer the uptime is to 100%, the better it is. Anything less than 99.90% is considered relatively poor. Wix’s score of 99.95% is pretty decent. The graph also shows Wix’s response time, i.e., the number of milliseconds it takes to get a response from their servers. A value in between 200-500ms is relatively good: more than 800ms can feel slow to the website visitor. Wix’s servers are located in the USA, which means that loading times are fastest there. Loading speed has become an increasingly important ranking factor for Google. That’s why we selected three random Wix templates and tested them for their page speed using Google PageSpeed Insights. Anything below 70 is relatively poor, a rating of above 80 is considered as good. The maximum is 100 points. How do I use a domain name that I already own? After logging into your Wix Account you will see the “Domains” menu. Here you can simply enter the domain name that you want to use. If you have already registered the domain name, they will show you how you can transfer it or point it to Wix (see screenshot). More information here. Where is Wix from and where do they host my website? Wix was founded in Tel Aviv (Israel) by Avishai Abrahami, Nadav Abrahami and Giora Kaplan. Tel Aviv is also where their headquarters are located. Furthermore they have offices all around the world: New York, San Francisco, Berlin, Sao Paulo and others. They are a public company, listed on NASDAQ: WIX. Their customer’s websites are hosted on servers in the United States. Is Wix actually good for SEO? Yes. If you are worried about SEO and want to reach the top of Google’s rankings, you can do so with Wix. We aren’t the only ones saying this, John Muller (Google employee since 2008) also thinks so. But remember that you’ll need to put together an SEO strategy. A little side-note: HTML5-Websitebuilder.com is our own Wix demo website and ranks surprisingly well in Google for a pretty competitive keyword: “html5 website builder”. Usually it’s on the first page of the search results. So don’t believe those who say that you can’t rank a Wix website on search engines! Does the "Connect Domain" plan really show ads? Yes, it does. For an example, you can check our demo site www.html5-websitebuilder.com. Do I need my own web space to use Wix? No, Wix is a hosted website builder. What that means is that by signing up they will provide everything you need for a complete website: the editor, the web space and a domain name. For a proper .com or .net domain you will have to purchase one of their premium plans. If I use Wix to build my website, will they own my content? The same applies if you purchase a domain name through them. They will never own it and you are free to transfer it to another domain registrar. Does Wix run both on PC and Mac? Wix runs in your web browser (Google Chrome, Mozilla Firefox or Microsoft Edge), it doesn’t matter if you are using a Mac or PC. Just make sure your browser is up to date! Wix Code is a unique way to add custom applications and dynamic pages to your Wix website. An example would be a registration form, where artwork and text can be submitted. Using this data you can now create dynamic pages on your website that include this information. Wix Code allows to create websites with a depth of features that currently only professional CMS can deliver. Find further information here. I can't see my Wix website on my mobile phone. Is it broken? Please make sure your mobile phone uses a modern operating system and browser. Check the latest specs here. 04 Feb 2019 – Small update in "Depth of navigation". 25 Aug 2016 – Wix allows you to use your own fonts now. 13 Aug 2015 – Video backgrounds and improved online store lead to a slightly higher rating. 17 Jul 2014 – Wix introduced its own Newsletter tool “ShoutOut”. 30 Jan 2014 – H1 tags can be added. 09 Jan 2014 – More detailed information about domain names. 10 Dec 2013 – Review of the blog feature added. 24 Sep 2013 – More storage space. 19 Jul 2013 – Supports Google Adsense now. 08 Apr 2013 – Review of Wix’s new HTML builder. The review for the old Flash-based model can be found here. 22 Nov 2011 – We have tested Wix’ server performance. 12 Jan 2011 – General update: support has not been reviewed this time.